At the latest studio night, Jeff brought over his upright bass so we could try out some tracking with it. It’s the first time I’ve recorded one of these, and I can tell it’s going to be fun working with it from both the recording side and the mixing side. He’s got a gooseneck microphone of unspecified vintage that is hooked to part of the bridge with a little C-clamp and snakes its way inside. I also threw a small condenser microphone on it after putting my head down in front to see where it sounded best. It seemed to work best about 18-24 inches away, pointed at the bottom of one of the F-holes. 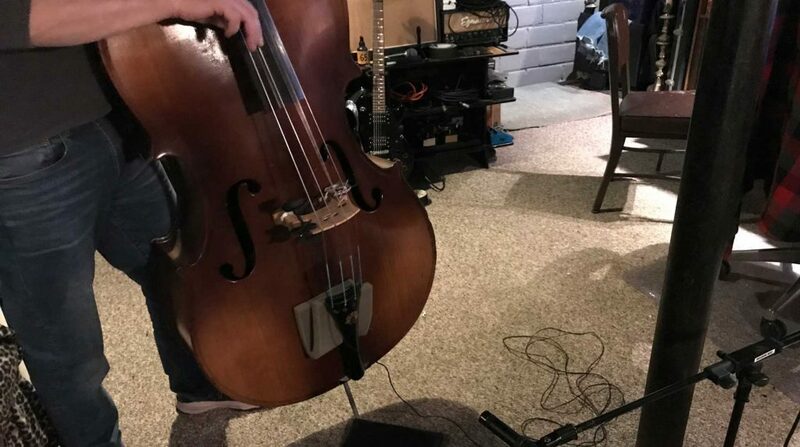 The inside mic really picked up the boomy body of the instrument as expected, and the condenser got a surprising amount of low end along with some of the cleaner, crisper sound of the string pulls. Pulling up the tracks in context (with some acoustic guitars, percussion and vocals) made it clear that I am going to have to figure out how to get this to sit in a mix. It’s got a hearty string attack, but not all of the notes sustain, and some of the notes (low D in particular) are just crazy loud compared to all the others. so I think there will probably be some multiband compression to tame some of that and even things out. I’m looking forward to figuring out how to make it work!